Interests - Action Man, Playstation, Cars, Football. Until March of 2003 James was a completely normal little boy, more like a mini whirlwind than a human being. A few months later we were told “James has Leukaemia” and our world was turned upside down. At the very beginning concern was raised because his legs started to ache. For the subsequent four months we took him back and forth from the hospital trying to find the cause. Orthopaedics, Paediatrics, Surgicals were all approached – no idea, growing pains maybe? So, stage one – off to Birmingham for a bone marrow aspirate (a needle driven into the bone marrow of his spine and a sample of tissue taken.). The result a slightly more accurate diagnosis – “James has Acute Lymphoblastic Leukaemia.” This determines the treatment regimen and off we go to Alder Hey Children’s Hospital in Liverpool as Birmingham has no beds. I love James, everyone who knows him loves him, you will too. I think the time has come for James to move on from Post Pals. During his illness you were a wonderful source of encouragement and happiness. Now that his treatment is finally complete and he is on the road to recovery, your resources would be better spent on your current group of sick children. 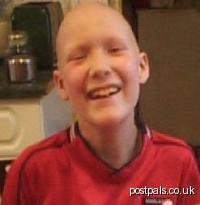 Thank you so much for all you’ve done, James had a miserable time and Post Pals really helped to put a smile on his face. James has pretty much fully recovered from the effects of his chemotherapy, although his feet are still flat and his stamina is very low. He regularly takes time off school due to general tiredness, and although his school are brilliant about it, we can’t help worrying that missing school frequently must be bad for him. The doctors say that he will eventually come round and be back to normal, it’s just a case of waiting and encouraging him! With any luck the long summer break will give him a chance to recharge his batteries. James is due to finish his chemo near the end of October, instead of being happy he is very depressed as he is worried about what will happen if the Leukaemia returns. It would be great to have lots of congratulation cards sent to him, as he was Post Pals’ first ever Pal. James is still moody but it’s because of his pills. He’s just had his nasty monthly drug, vincristine, and has been off school all week but can hopefully get over this during half term. Thank you to Sue Cuin and Julie Barret for sending James and myself (Philippa, his twin) lots of cards during the past month. James is back at school now (after 2 years at home). He is adjusting really well but finds sport and games a little hard going. With James’ determination things are settling down though and he has the teachers eating out of his hand. Health wise, all treatment is going as it should. Counts are staying stable. Thank you everyone who has responded to James’ low time. He really has appreciated the surge of cards and stickers and stuff that you’ve been sending. Thank you from him and us! James is having a “good” time at the moment. Health fair, just suffering from the heat. But I guess a lot of people who aren’t ill are doing that too! James is having a rough time of maintenance at the moment. He’s laid up one week each month with bad feet and legs, and he’s very tearful. Sadly a side effect of vincristine and the steroids. His counts are remaining promising however. Not really much doing with James’ treatment at the moment, all as it should be. He’s off at a church sleepover this weekend with Philippa. It’s the first time he’s been out of the house overnight without a parent in the last 2 years, but he’s fine about it – it think its us who are having the hard time of it. James is doing OK. Just seems to get really miserable once a month when he’s taking his steroids. James is doing really well at the moment. Mood swings from his steroids and irritation from his drugs. Otherwise all well. He’s in to hospital on Wednesday (24th November) to have his port taken out. It only seems like yesterday he had it put in. James’ mum is also in hospital following a heart attack, his Dad said it was a fairly mild one, and so she’s hoping to be out around Tuesday. How ever I’m sure the family could do with some extra TLC at the moment. James and his family are taking a much deserved holiday, we hope they have a lovely time away. James is also doing ok, last week his family went to a trip to their local Snow Dome (with real snow!) organised by Post Pals, there they did tobogganing, and ice-skating, and no doubt threw a few snowballs! His Dad has uploaded photographs of the day, they can be seen here Thank you to Jon for sharing the photographs, and to the Snow Dome for kindly donating these activities. Yippeeeee!!! Finally made it to Maintenance. The Intensive bouts of treatment made James so ill that he has really been looking forward to this part. Daily pills, and monthly injections ~ what an easy life. Still, its not going to stop until October 2006 though!!! James is a bit more cheery now and says a huge Thank You to everyone who has mailed him with words of support. Only one more lumber puncture to go until the intensive block of chemotherapy is over, and starts on the maintenance stage. James is now thankfully in remission – which means that the original dose of chemotherapy has killed all of the leukemic cells in his bloodstream. However this does not mean that he is out of the woods. The next part of his treatment is called “maintenance” which is four-week bands of mild chemo interspersed with four-week bands of intense chemo. During this time James is expected to be neutropenic – which means that he is very susceptible and will spend much of his time in hospital. This is expected to last three years. Only then will we know for sure James has been cured.